You are not logged in. [Log In] Home » Forums » Mac OS X Software » Mac OS X Applications » How change Notes Lock password? #47194 - 12/10/17 06:48 PM How change Notes Lock password? I made a simple 4 digit password to lock Notes. I can't remember when I did it, or how change it to a longer one? I googled and it seems the only way on phone? settings. confusing. says reset password. I did that, but did not work? Is that resettting my apple ID? Totally confusing. Thankfully is did not do that. I'm not sure what it did, but I still don't know how to change notes password. 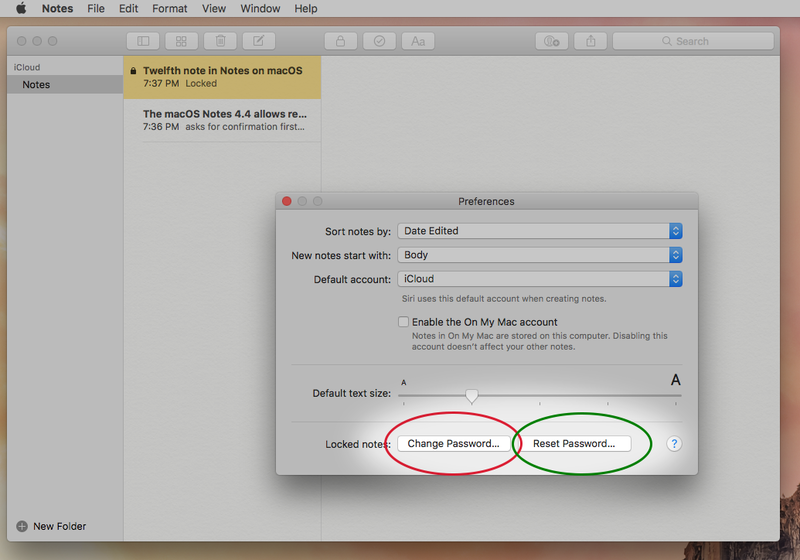 The macOS Notes 4.4 allows resetting the password in Preferences. It asks for confirmation first and states that old notes are not affected (initially). Then it asks for your Apple ID passwords once, as it will probably be iCloud synchronized. Then another ‘Are you sure?’ Then enter the new password twice and an optional hint. Note that you do not need the old password to reset things. Now you can use the old password for old notes, and the new one for new notes. If you enter the new password for an old note, followed by (next try) the old password for the old note, then you will be given an option to change the password for all notes to the new password. 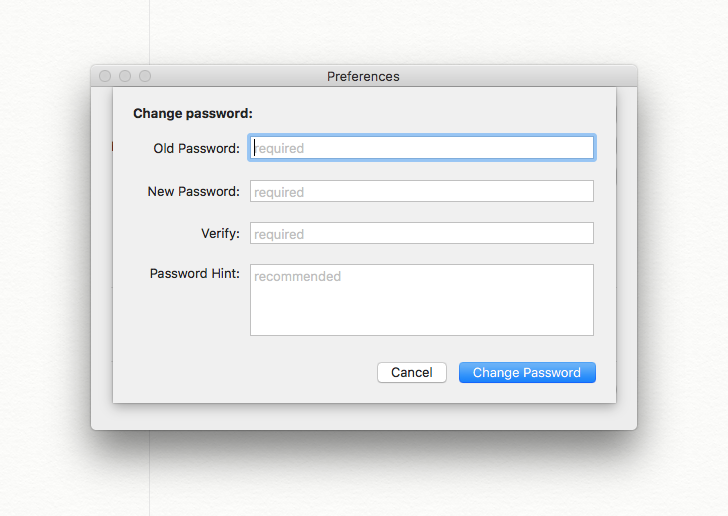 The macOS Notes 4.4 allows changing the password in Preferences. This will be more straight-forward. The password for all notes changes at once. Note that you do need to remember the previous Notes password to set a new one. Thanks U, I did all from the iphone, that exactly, and nothing happened, did not work, new notes still use old weak 4 digit. You mentioned easier way? I would prefer doing this on desktop now laptop. Did not understand you last sentence. You posted this in ‘Mac OS X Applications’, so I presumed the desktop version of Notes. My previous description was about doing this on desktop or laptop. Notes on macOS desktop can share with iOS iPhone, but doesn’t have to. They can be separate. They can be local (non-iCloud). I can’t know your situation without you telling it. The preference pane for macOS Notes has two buttons for altering the password: Change or Reset. That is what I described in my previous post, with their subtle difference. Changing (not resetting) the password asks for the previous password as well, that’s all. Excellent U finally, ok worked great, just did it on laptop.. Now I wait to see if works later on iphone. Everything should sync in cloud: lap, desk, iphone. I did change password, don't understand reset..? Generated in 1.555 seconds in which 1.159 seconds were spent on a total of 14 queries. Zlib compression enabled.